You can only control 1 “Yuki-Onna, the Ice Mayakashi”. While this card points to a Synchro Monster(s), your opponent's monsters cannot target this card for attacks. If a Synchro Monster(s) in your possession is destroyed by battle or an opponent's card effect while this card is on the field: You can target 1 face-up monster on the field; its ATK/DEF becomes half its current ATK/DEF until the end of this turn. 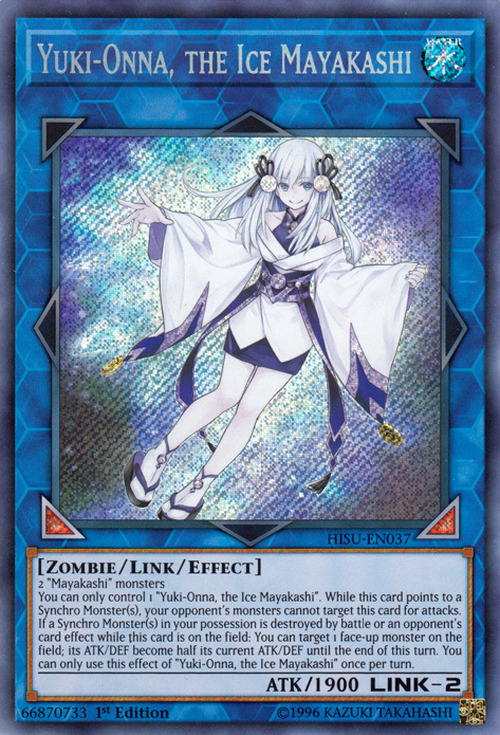 You can only use this effect of “Yuki-Onna, the Ice Mayakashi” once per turn. This monster, “Sea Monster of Theseus”, “Yuki-Musume, the Ice Mayakashi”, and “Sacred Spirit of the Ice Barrier” are the only WATER Zombie monsters released in the OCG and TCG. Yuki-Onna, the Ice Mayakashi is based on the yuki-onna (雪女, snow woman), a yokai that takes the form of a beautiful woman that has extremely pale skin and sometimes wears a kimono. Yuki-Musume (snow girl) appears to be her younger version. This is currently the only Mayakashi Link Monster. This monster appears in the card artwork of Mayakashi Memorial.